Whole families are here - elderly supporters have made epic journeys alongside their grandchildren to share a first appearance at a World Cup since 1982 with them. It has been impossible to resist their colour, warmth and humour. For me, it all started in their opening game against Denmark in Saransk on Saturday. As Christian Cueva ran up to take their first-half penalty, one man wearing a pair of giant plastic ears leaned over railings by the side of the pitch, as far as he could to be that little bit closer. A moment 36 years in the making was surely about to arrive. Cueva fired over the bar. The man's arms stretched forward, wide and low in a gesture of great pain. The plastic ears almost slipped off the front of his head. 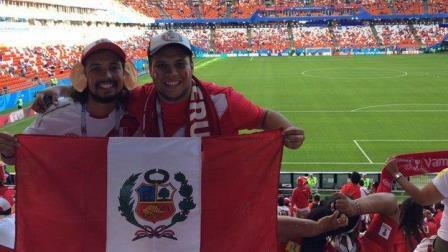 "He needed a cool mind in a hot situation," Peru fan Edgar told me the next day, grabbing my arm and planting his feet hard into the ground as if to emphasise his point. "It was the moment - but no matter, we've got two matches left and we're going to win." Edgar is with Manuelito, who is 80 years old and arrived in Saransk via three flights and a 10-hour night train. Having practically lost his voice, he says softly: "The journey was brutal for me but how could I miss this? "We have waited so long, I have waited so long, to sing our songs in another country once again."